Thundershirt Grey for dogs is the best calming solution to treat most of your dog fear and anxiety issues. 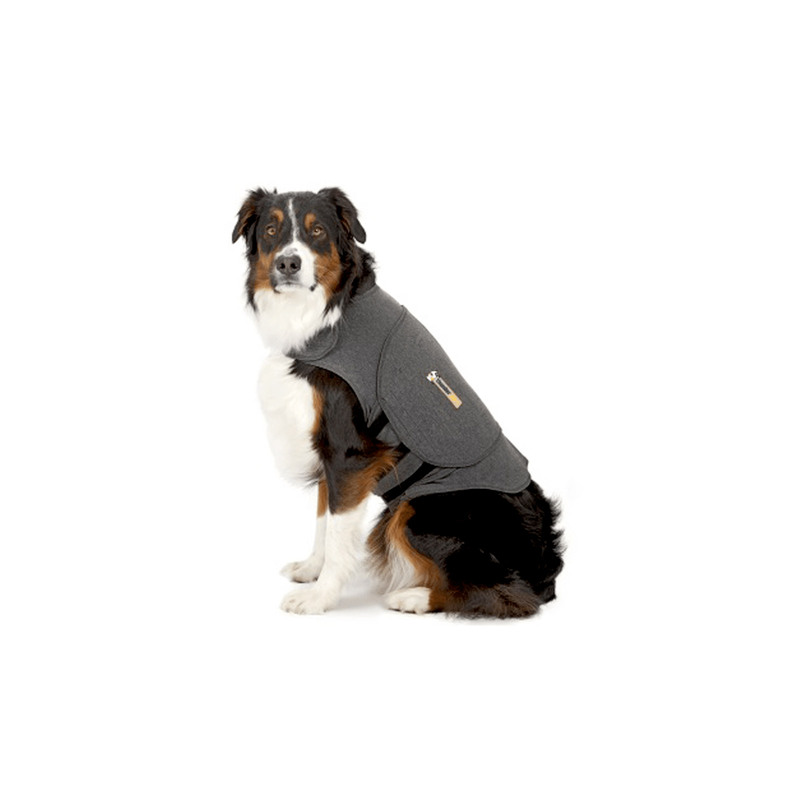 Just putting a Thundershirt on your dog, you can relieve them from most stressful symptoms. With gentle, constant pressure, Thundershirt helps to calm dogs from all types of anxiety, fear and over-excitement issues. With over 80% success rate, this drug free product is safe to use on pets. It is highly beneficial during vet visits, travelling, grooming, training and parties and celebrations. Highly recommended by veterinarians, Thundershirt is useful for trainers, pet families and shelter and rescue houses. Thundershirt is specially designed to provide relaxing effect through its hugging formula. Its constant gentle pressure has a remarkable calming effect on the nervous system of dogs and may release calming hormones like endorphins or ocytocins. This helps to calm and relieve your dog from stress, fear and anxiety. X Small 33.02 cm - 45.72 cm (Chest Size) and weighing between 4.55 kg and 8.18 kg. Small 40.64 cm - 58.42 cm (Chest Size) and weighing between 6.82 kg and 11.36 kg. Medium 45.72 cm - 66.04 cm (Chest Size) and weighing between 9.09 kg and 22.73 kg. Large 60.96 cm - 81.28 cm (Chest Size) and weighing between 18.18 kg and 31.82 kg. X Large 78.74 cm - 101.6 cm (Chest Size) and weighing between 27.27 kg and 45.45 kg. Choose one according to your dog size and weight. Anxiety gets the better of my pal Brutus especially when we go for vet visits. Thundershirt has somehow helped me in calming him down. Decent product to have in crunch situations. My dog somehow loves to wear Thundershirt. Whenever I take it out, he just snatches it from me to wear it over again. Probably it keeps him calm and makes him feel safe. He has stopped gnawing as well. The product has been effective so far in keeping him stress-free. My Charlie used to jump and dart in over-excitement while seeing a stranger. Perhaps, it was out of fear that he used to hide himself up in a toy box of my kid. After using thunder shirt, his excitement and fear has normalised remarkably and he doesn't hide anymore on seeing a new person. This garment has certainly worked really well. Hi, I ordered this product for my Dan and it had great effect on him. He is so relaxed and stress free now. Thank you! The best calming solution for my pet I have tried till now. Worked like a charm! !